Successfully Added COB LED Headlight - 110 Lumen, Up To 100,000 Hour Service Life, Durable Design, 3 Light Modes, Weatherproof (Black) to your Shopping Cart. If you are looking for a highly affordable LED headlight, then this 110 Lumen flashlight is the perfect tool for you. Available for less than 3 Dollars, this cheap headlight certainly brings value for money. With its durable ABS body and IPX 4 weatherproof design, it can be used in any weather condition. Rain, snow, or ice – nothing will stop this beauty from working the way it should. 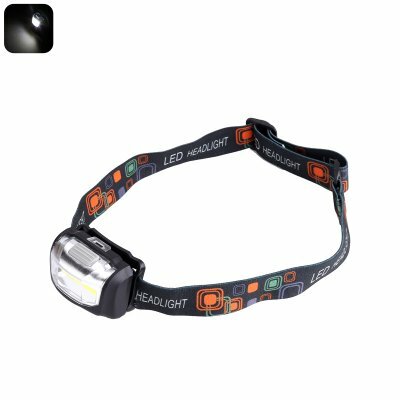 Coming with a comfortable headband, this 100lm headlight can be comfortably worn for hours in a row. Its adjustable strap additionally lets you tighten or loosen itself in no time, making it suitable for people of any age. With a service life of up to 100,000 hours – this affordable COB LED will light up the path in front of you for years to come. Supporting three different lighting modes, you will be able to select from High, Low, and Flash – assuring that you’ll always have the right type of light at any occasion. This 3W LED headlight is perfect for people that like to go out for a walk after dark, for camping, or for those that work in dark environments. With this powerful LED at your disposal, you will never be left in the dark again. Light up whatever lays ahead of you and never run into nasty surprises again while out at night, this headlamp is a must have accessory for all outdoor enthusiasts out there. This LED torch comes with a 12 months warranty, brought to you by the leader in electronic devices as well as wholesale electronic gadgets.